Richard Robarts came late to racing, only starting when he was in his mid 20s, but quickly started to make a mark in Formula Ford in 1971 and 1972. 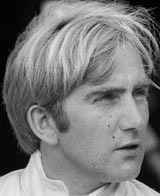 He switched to Formula Three in 1973 with immediate results as he finished third in the championship. His Formula One chance came the following year when he paid to be the No. 2 driver in Bernie Ecclestone's struggling Brabham team. A series of indifferent drives led to him being ditched before the season was a third done. A second chance came when he was offered a drive by Frank Williams but he had his car pulled out from under him when Tom Belso crashed his own car and Williams gave him Robarts'. He continued to race in various categories without any real success, he raced for the last time in 1978. He subsequently ran a coach-building business in Essex.